Dryden High School Online – Page 438 – Building a culture of learning. It was a busy Tuesday for DHS athletes. All four court sport teams played their home openers, and the golfers were at Eagle’s Landing for NorWOSSA golf. The golfers had a great day, with the girls winning the NorWOSSA Gold medal and the boys bringing home Silver. Amanda Wheatley defended her title to win the Individual NorWOSSA girls championship with Brett Getson finishing 5th overall in the boy’s division. The teams now travel to Fort Frances next week for the NWOSSA final. In volleyball, the Senior boys took out the Fort Frances Muskies in four sets, 25-21, 20-25, 25-20 and 25-18. The Junior boys played hard but came up a bit short, falling to the Muskies in three, 25-20, 25-21, 25-17. On the basketball court we had two close games, with the Senior girls falling 25-19 against the Muskies. Melissa Felske made 9 points to lead all scorers. Jessica Skillen added 6. The Junior girls turned up the heat late in the game, but were unable to catch up to the Muskies, finishing down 14 for a 30-26 final score. Morgan Church scored 13 points and Emile Gardam made 6. Congrats to all Eagles Athletes for your efforts! 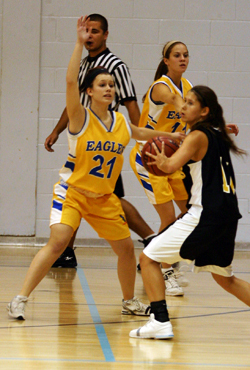 Eagles Court sports travel to Kenora to take on Beaver Brae on September 30th. Look for a rematch against Fort Frances at home on October 6th. Don’t forget to come out to the Eagles Football homecoming match this Friday, September 25th at 2:00 pm. Sept. 23 It was a good day on the course for the boy’s and girl’s golf team yesterday with the girls winning the NorWOSSA Gold medal and the boys bringing home Silver. Amanda Wheatley defended her title to win the Individual NorWOSSA girls championship with Brett Getson finishing 5th overall in the boy’s division. The teams now travel to Fort Frances next week for the NWOSSA final. Sept. 18 – 25 Do you have an interest in the following areas: recreational activities during and after school, media arts, native art, cultural identity, mentoring and tutoring, or native theater? If this sounds like something that would interest you, please attend a meeting in room 131 during Block D on Friday, Sept. 25. Eagles vs. Fort Frances today! Come out and cheer on your DHS Eagles today! At 12:00 we’ll have the senior girls basketball team in the big gym and the senior boys volleyball team in the small gym. Our juniors take the courts at 1:30, with girls basketball in the big gym and boys volleyball in the small gym. Come back to dhseagles.com for game pictures and updates.